Even though I wasn’t expecting much, I am so glad I followed all the clues. The stars were aligned properly, though: this soup was phenomenal. I was blown away by its taste. Healthy food does not need to be bland! This soup was both incredibly delicious, healthy and a snap to put together. I adapted the original recipe from ExtraVeganZa only slightly, with less oil and likely more yam. 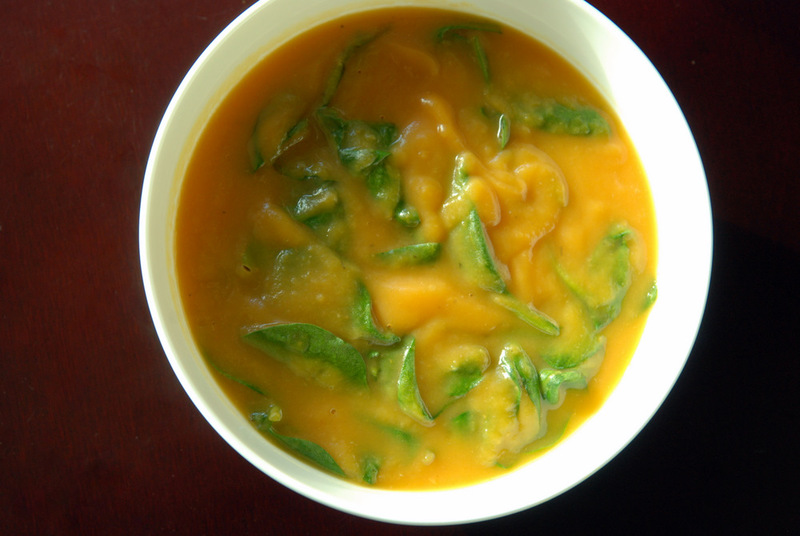 This soup was silky smooth from the pureed yams. I rarely go to the trouble of squeezing my own orange juice, but with an overabundance of citrus and a new lemon squeezer, I had no excuses. The freshly squeezed juice is paramount for this recipe. The delicate splash of citrus made this a light-tasting soup, and the extra dimension came from the dill and ginger. They really brought the soup to the next level with the curiosity it raised with each spoonful. The soup would likely be great without the spinach, but the extra bulk made this a soup with texture. A perfect play from winter’s finest characters. It brought a smile to my face with its first bite. This is my submission to Deb for this week’s Souper Sundays, and to Torview for her green Food Palette event. 1. In a medium pot, heat the oil over medium-low heat. Add the onions and sweat for 2-3 minutes. Add in the garlic and ginger, and sweat for another 3 minutes. Add in the yams and toss all the ingredients together. Make sure the ingredients do not stick to the bottom. 2. When the onions are soft, stir in the salt, dill and water. 3. Bring to a boil, then reduce to a simmer and cover for about 15 minutes. Remove from heat. With an immersion blender, blend this mixture on high until a creamy and smooth consistency is reached. Add the spinach and orange juice, stir and cover the soup, allowing the spinach to wilt in the steam. Serve immediately. That’s such a great cookbook–one of my favorites. Your soup sounds fantastic. Such an interesting mix of flavors and textures! And besides, how could anything with sweet potatoes be bad? 😉 Glad you listened to the stars! I am so tempted to make it– what a combo of ingredients!!!! 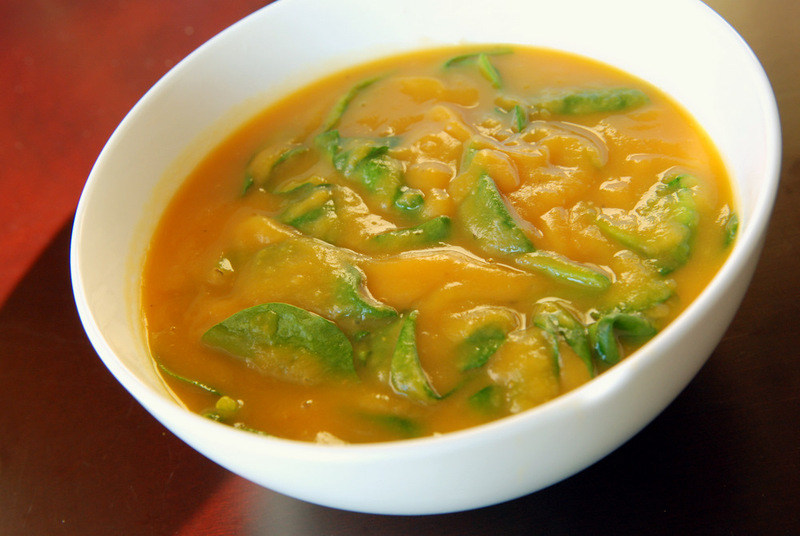 yam n spinach with orange; wow– the colour n texture speaks volumes ! bookmarked !! This is definitely a prime example of just how delicious healthy food can be. And, yeah, fate definitely did gather itself together to practically coerce you to make this soup! You really had no choice in the matter. this looks so delicious! i love all of your recipes- you make simple ingredients come together and taste AMAZING! this is a beautiful soup that would definitely warm me up! I’m so glad the forces of destiny all lined up and facilitated you making this soup! 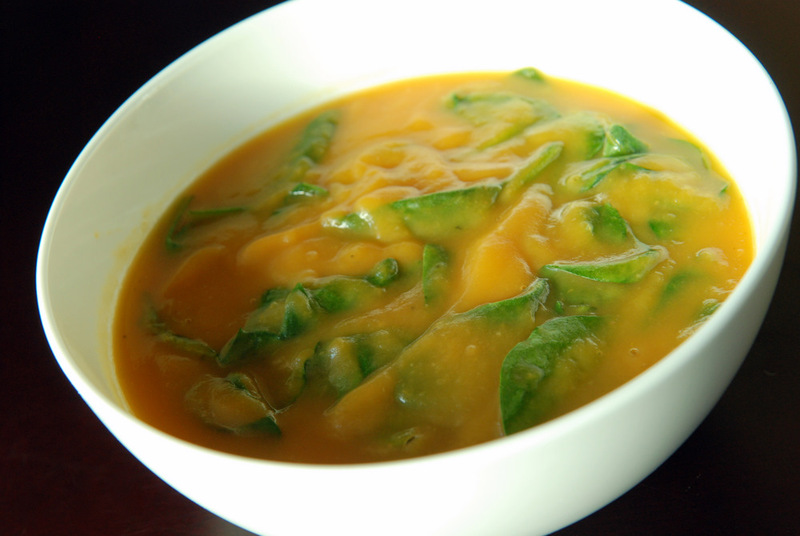 I love dishes that combine dark green and orange vegetables, so this soup looks perfect. I had a traumatizing orange soup experience though so I’m a bit wary of the orange..